Compendium of Podiatric Medicine and Surgery 2012 is updated on a yearly basis and your subscription is automatic with the purchase of this publication. Subsequent books will be sent to you automatically and billed at the then-current prices. If you do not wish to receive any updates, you must write a letter with your name, company name, address, phone number, and publication, to cancel your subscription. Cancellations may be faxed to 410-494-0515 or mailed to Data Trace Publishing Company at P.O. Box 1239, Brooklandville, MD 21022-9978. 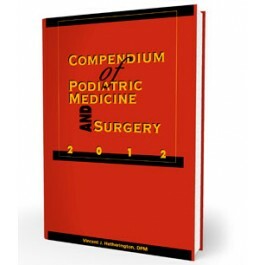 The Compendium of Podiatric Medicine and Surgery 2012 again seeks to fulfill its mission by providing a source of reviewed articles giving podiatric physicians an opportunity to enhance their knowledge and stay up with new findings and developments. The Compendium allows physicians to review content in their area of interest and choose topics or articles for further investigation as they feel appropriate. In this edition of the Compendium, an effort was made to seek out articles with higher levels of evidence as well as pertinent review articles. In a recent publication in the Journal of Bone and Joint Surgery, Zaidi and his colleagues reviewed the following journals, Foot and Ankle International, Foot and Ankle Surgery, and The Journal of Bone and Joint Surgery from 2000 to 2010.1 They concluded that the level of evidence for foot and ankle surgery literature reveals a trend toward higher levels of evidence, however, the difference was not found to be significant. Unfortunately, the review may have been somewhat limited as the manuscript did not include journals such as The Journal of Foot and Ankle Surgery, Journal of the American Podiatric Medical Association, or The Foot. The development of level I evidence has proven to be difficult to attain, especially with research directed towards surgical intervention. The increasing number of outcome scales, scoring, and measurement systems further complicates the ability to review and compare published works presented for consideration by professionals. Button and Pinney, in a metaanalysis of rating scales for foot and ankle surgery, suggested that only validated rating scales should be considered.2 The dissatisfaction with the review of published articles is also reflected in the increasing number of recommendations or proposed review processes and procedures. It is important to remember that all proclaimed level I evidence should not be taken at face value and requires careful reading of any manuscript. Lower levels of evidence still provide relevant and important information. Determining the value of the evidence provided in medical publications is still in the eye of the reader. 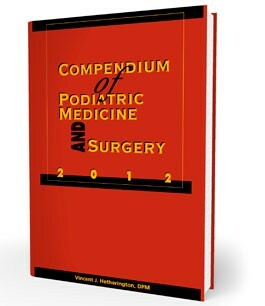 I would like again to thank the chapter editors and abstract reviewers for participating in the development of this edition of the Compendium of Podiatric Medicine and Surgery; without them it would not be possible. 1. Zaidi R, Abbassian A, Cro S, et al. Levels of evidence in foot and ankle surgery literature: progress from 2000 to 2010? J Bone Joint Surg Am. 2012;94(15): e1121-1110. 2. Button G, Pinney S. A meta-analysis of outcome rating scales in foot and ankle surgery: is there a valid, reliable, and responsive system? Foot Ankle Int. 2004;25(8): 521-525.
edited by Barbara Marshall, D.P.M. edited by Erika M. Schwartz, D.P.M., Eunis Bello, D.P.M., and Neil D. Brown, D.P.M. edited by Lawrence A. DiDomenico, D.P.M. and Ramy Fahim, D.P.M. edited by Andrew J. Meyr, D.P.M. and Ashley Mayer, D.P.M. edited by John S. Steinberg, D.P.M. and David W. Lee, D.P.M. edited by Kathya M. Zinszer, D.P.M. edited by Metin Yavuz, D.Eng.